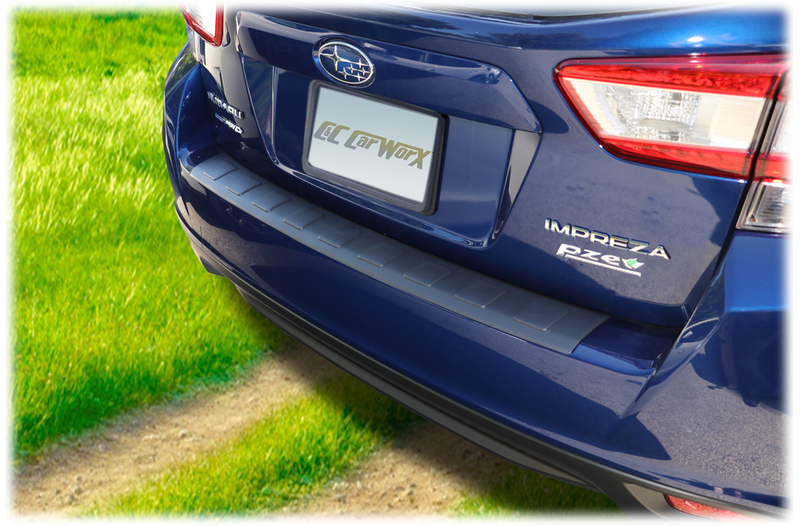 Designed and manufactured to fit perfectly on the 2017, 2018, 2019 Impreza Hatchback model rear bumpers, the C&C CarWorx rear bumper cover has a smart look and even smarter value. 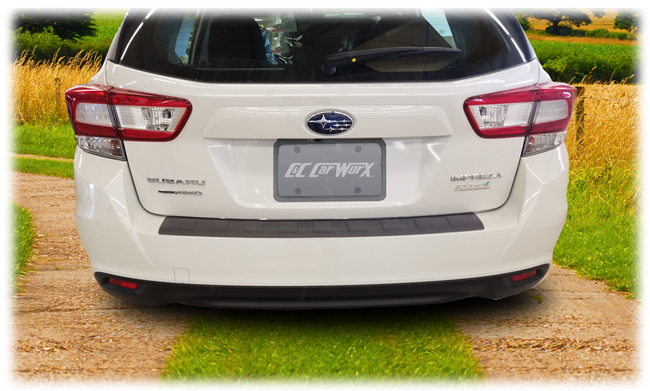 Customer testimonials confirm overwhelming satisfaction with the protection provided by the C&C CarWorx Rear Bumper Cover to fit 2017, 2018, 2019 Subaru Impreza 5-Door Hatchback models. 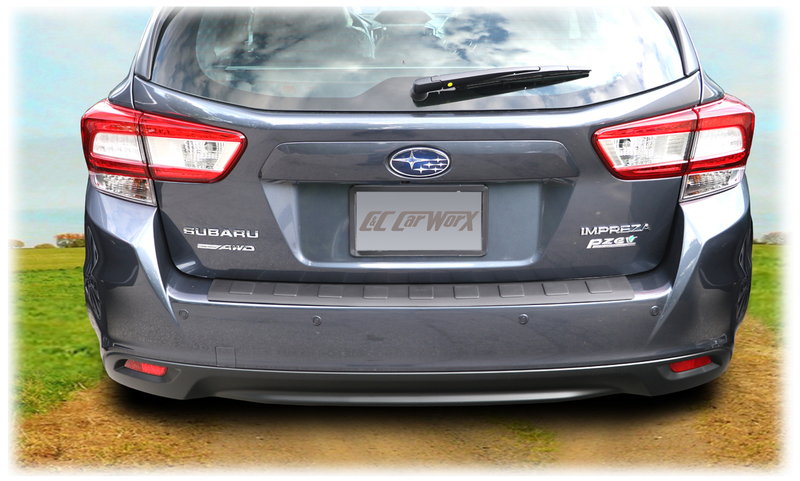 37-15/16" w. x 3-7/8" h.
To protect the loading area of the rear bumper on all 2017, 2018, 2019 Subaru Impreza 5-door Hatchback models, we offer our rear bumper cover that protects unpainted and painted rear bumper surfaces. 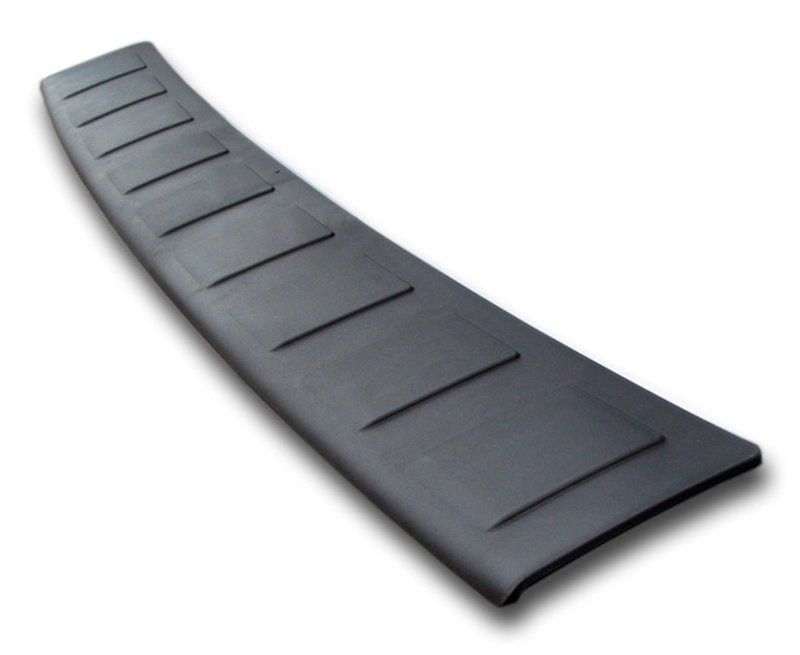 The addition of this protective accessory preserves the integrity of the soft plastic rear bumper and painted surfaces vulnerable to damage from loading and unloading cargo, pets, sports equipment, passengers, groceries, etc. 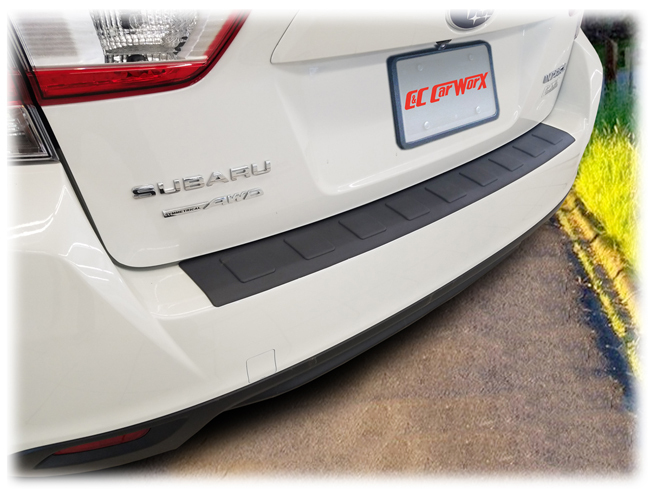 Customer testimonials confirm overwhelming satisfaction with the protection provided by the C&C CarWorx Rear Bumper Cover to fit 2017, 2018, 2019 Subaru Impreza 5-Door Hatchback. Great fit, easy to install! This is just what I was looking for, not the thin plastic sheet that Subaru offers which doesn't look like it would last a minute with the kind of loading and unloading I do. Highly recommended! Everything about the transaction was fantastic. The pictures on the website showed the exact part with the exact car that I was looking for. After an easy online order, the part was shipped quickly. 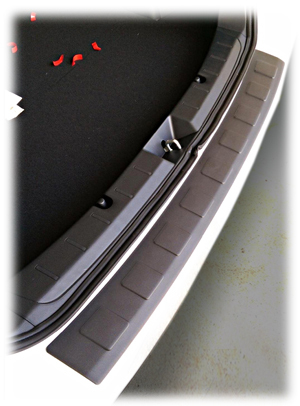 After receiving the accessory, the install was quick and easy with a registration mark on the part to make sure that it's centered just right! Great stuff. I looked high and low for a real bumper cover for a '17 Impreza 5D, and finally found this one. I've not installed it yet because the car is in another state at the moment, but it looks good and of high quality. Unless the fitment is off, (which I don't know yet) I have no qualms recommending this piece. I wanted a rubber bumper like I had (standard) on my Forester, but for some reason, Subaru only offered a color-matched piece of stick-on decal material. This item filled the void, fit, and was easily installed. The pad fits correctly. The installation instructions were simple and easy to follow. Well-constructed and easy to install. Contours very well to the shape of the bumper. 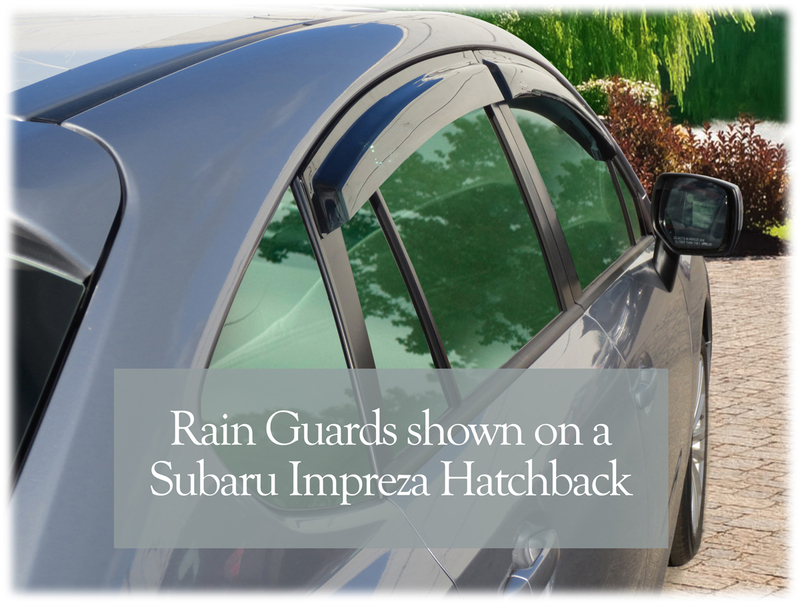 This is less expensive and (in my opinion) better looking than Subaru's clear applique. As a dog owner, I also expect this will survive more abuse than the applique in the long run. Definitely recommend!